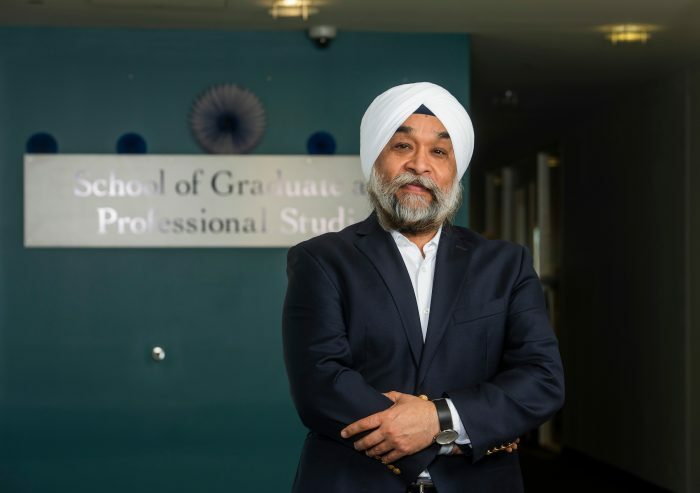 Southern has tapped Manohar Singh, former dean of the College of Professional Studies at Humboldt State University (Arcata, Calif.) with a track record of initiating new programs, to become the new dean of the School of Graduate and Professional Studies. Singh recently began his new duties after a nationwide search concluded last November. Robert Prezant, provost and vice president for academic affairs, called him a “proven fundraiser,” and noted that he has been making the rounds on campus to meet members of the campus community and to increase his understanding of the graduate program needs. At Humboldt, Singh helped launch an effort to raise $10 million for an endowed R.N. to B.S.N. program. He also led the development of new programs, such as online programs in education in collaboration with Cal State Tech. Before his role at Humboldt, he served as division head for the Division of Business and Social Sciences at Penn State University – Abington, and interim chair of the Department of Finance at Long Island University. At Penn State, he led the effort to establish new academic programs, such as a fast track M.B.A. in collaboration with Penn State Great Valley, as well as bachelor’s degrees in rehabilitation and human services, and in accounting. He also launched four minors. He has a background in finance and economics, having earned a Ph.D. in finance from Southern Illinois University-Carbondale, and two master’s degrees in economics – an M.A. from the University of Waterloo-Ontario, Canada, and an M.A. with honors from Punjab University in India. Singh has earned many faculty awards, including the Great Valley Award for Teaching Excellence from Penn State and the University of Nevada-Reno College of Business Researcher of the Year Award. He served as chairman of the Penn State Grand Valley Faculty Senate and has held the title of full professor of finance since 2016. Singh said he is excited about the opportunity to serve as the new graduate school dean, especially at this point in Southern’s development. Singh said he would like the school to stand out for scientific rigor, social responsibility, market responsiveness and innovation. “We already have several initiatives in progress to offer market demand-driven, flexible, and affordable, graduate programs in emerging areas,” he said. “We are expanding our non-degree credentials and certificate programs to serve the dynamic needs of working professionals and adult students as they aim to advance their careers.